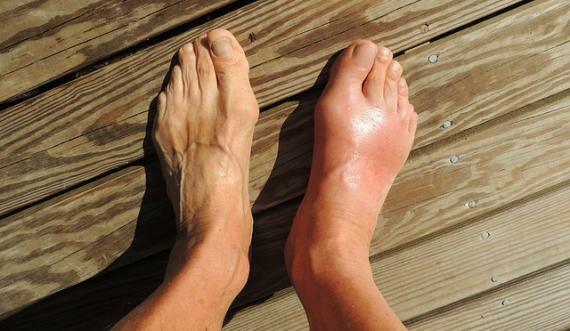 Gout is basically a type of arthritis that are mostly caused by the buildup of uric acid in the blood. Uric acid is formed in the blood by the breakdown of the waste elements called purines in the body. These are usually dissolved in the blood and processed through the kidney and excreted via urine. However, some people may form an extra uric acid that remains in the blood and forms crystals. These crystals coagulate in the joints. This causes severe pain, swelling and redness in the joints, particularly at the joints of the big toe. These problems are quite common in overweight male over 40 years of age. There may be other causes for gout such as genetics, excessive consumption of alcohol, excessive protein consumption, less physical work or high level of stress. It is also linked to other health problems such as diabetes, kidney stones, hypertension etc. Take about an equal quantity of ginger powder, turmeric powder and fenugreek powder. Mix all these powders together and consume 1 tablespoon daily with a cup of warm water. In another method you can take about ½ tablespoon of ginger root and add it to a cup of boiling water. Stir the mixture and consume it at least once a day. You can also add some ginger in your food. You can also use ginger as a paste. Take a little water and raw ginger to form a paste. Apply the paste on the affected area and leave it there for about 30 minutes. After sometime rinse off with clean water. Repeat this daily to get rid of gout pain. Cherries are a rich source of anthocyanin and antioxidant, which helps in reducing the inflammation and also are quite effective in minimizing gout flare. Cherries helps in removal of toxins from the body and assists in cleansing of the kidney. Include cherries in your regular diet. You can consume about 20 fresh cherries every day in the morning to instigate maximum health effect. Canned cherries also have a similar effect. Taking a glass of cherry juice with a few cloves of crushed garlic every day. You can also consume cherry compote, jam, tea or a cherry pie. Pineapples are also considered as effective as cherry. Alkalizing the body can help you in getting relief form the gout pain. Lemon helps in neutralizing the excess uric acid in the blood stream. This can be easily carried out by using fresh lemon juice with baking soda. Other than lemon juice, you can also consume other fruits that are rich in vitamin C.
Take a lemon and squeeze all its juice. Add about a half tablespoonful of baking soda in the lemon juice. Put the mixture in a glass of water and stir well. Drink the solution immediately for maximum relief. You can repeat this regularly for result. You can also drink lemon juice by mixing it with water and using it about 3 times a day. Epsom salt is also quite effective ingredient for home treatment of gout or any other form of arthritis. High magnesium content in the Epsom salt helps in lowering high blood pressure. Soaking the affected area in the warm water solution helps in relieving pain. Add about 2 cups of Epson salt in a bucket of warm water. Keep affected body part in the water until it cools. Repeat this once a week for better result. If the gout pain is severe you can use this more often. It is used in the treatment of several ailments. It is also quite effective in treating arthritis and gout. Acidity in the vinegar helps in reducing severe pain. You can also use honey along with the Cider vinegar to boost anti-inflammatory response of the body. Add about 1 tablespoonful of apple cider vinegar in a cup of water and drink it about 2 to 3 times a day. If you find it useful you can increase the dose to 2 tablespoons. Another method to use cider vinegar is to mix it with equal quantity of honey. Honey helps in boosting anti-inflammatory response of the body and you can drink this mixture twice a day. You can continue with the mixture until relief is received from the pain. Activated charcoal can absorb uric acid, so, it is quite effective in treating gout. People suffering from gout can take a charcoal bath 2-3 times per week to get relief. Take about ½ cup of charcoal powder and mix it with little warm water to make a fine paste. Pour this paste into bath water. Now soak the affected body part in the water for about 30 minutes. This remedy is quite helpful for big toe or ankle joint. Repeat the same for about 2 to 3 times per week. You can also apply this paste directly on the affected area and leave it there for about 30 minutes. Once done, you can rinse off with lukewarm water. This remedy can be repeated on a regular basis for gradual relief. Apple contains malic acid, which is quite helpful in neutralizing uric acid in the body. The neutralization of uric acid helps in reducing inflammation and pain. You can consume apple directly. You can also try apple juice or food containing apples. Banana are also quite effective in treating gout. High potassium content in bananas helps in conversion of uric acid crystal present in the body in liquid form, which can be easily flushed out of your body your urination at a later stage. Banana also contains a moderate amount of Vitamin C and it can be quite effective in managing swelling and pain. You can have 1-2 banana every day to witness some improvement. You can also consume banana with yogurt for maximum benefit. Baking soda can help in reducing the uric acid amount in the body. This will result in less swelling and pain. Take about ½ tablespoon of baking soda and mix it with a cup of water. Stir this solution well and drink it. You can consume this solution up to 3 times every day for 2 weeks. Do not consume more than 3 times per day. If you are suffering from Hypertension, then please avoid this remedy. Placing the affected area in cold water helps in reducing the swelling and pain. If you are suffering from gout do not apply ice directly on the skin, it can cause damage to the skin and worsen your condition. Put the affected part in the cold water for about 10 to 15 minutes and repeat the process several times a day. You can also use an ice pack for about 15 minutes, but as mentioned earlier do not apply it directly on the affected area rather wrap it with a towel before placing it. You can use this twice a day, but excess usage of it may increase the crystallization of uric acid. Use decaffeinated drink to lower uric acid. If you still suffer from high fever/chills and your symptoms are not improving then please contact a doctor immediately for medical attention.